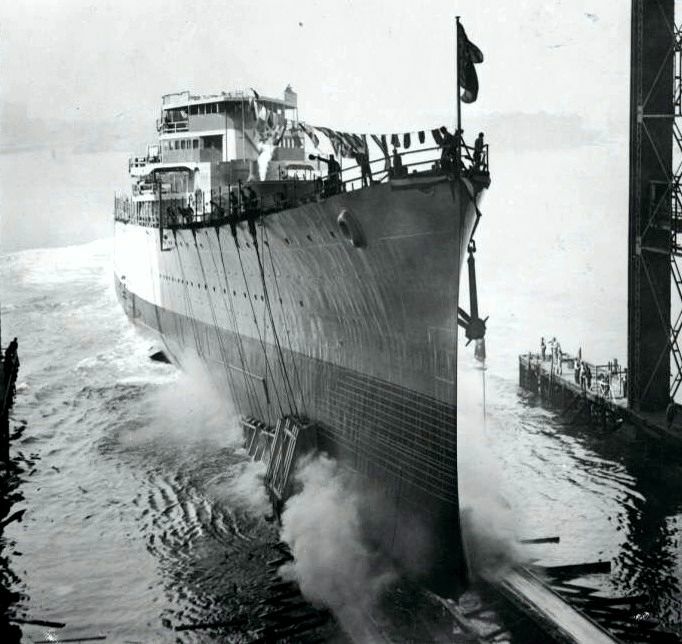 USS Nashville (CL 43) being launched at the New York Shipbuilding Corp., Camden, NJ on 2 October 1937. 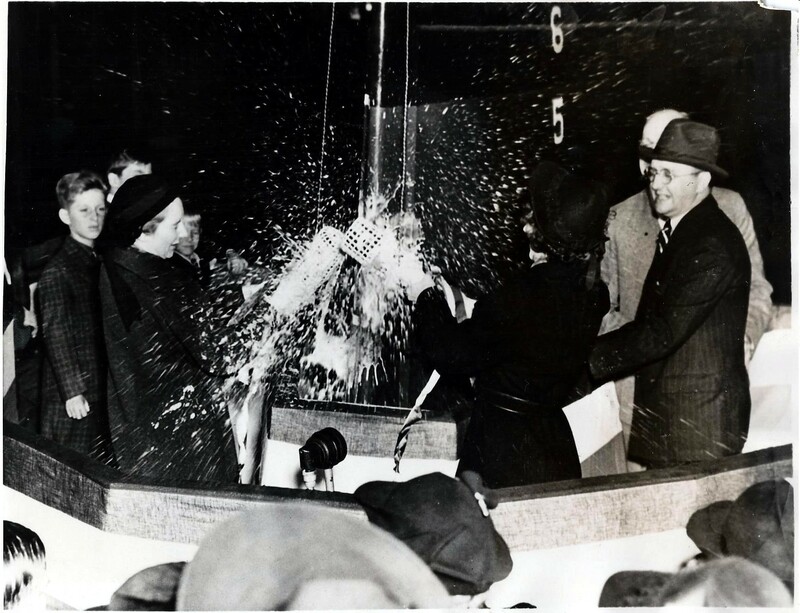 "The bottles broke, the crowd cheered and the band played, but the ship didn't budge - until several minutes later." Undated late WW2 port bow photo of the USS Nashville (CL-43) off Sydney, NSW, Australia. Main deck mounted secondary guns 5”/25 gun tubs and her rebuilt bridge is distinctive from her original configuration. USS Nashville being guided to a berth at the Philadelphia Navy Yard on 5 October 1938 for a post-shakedown availability. Temple Digital Archives, used for educational and non-commercial purpose. 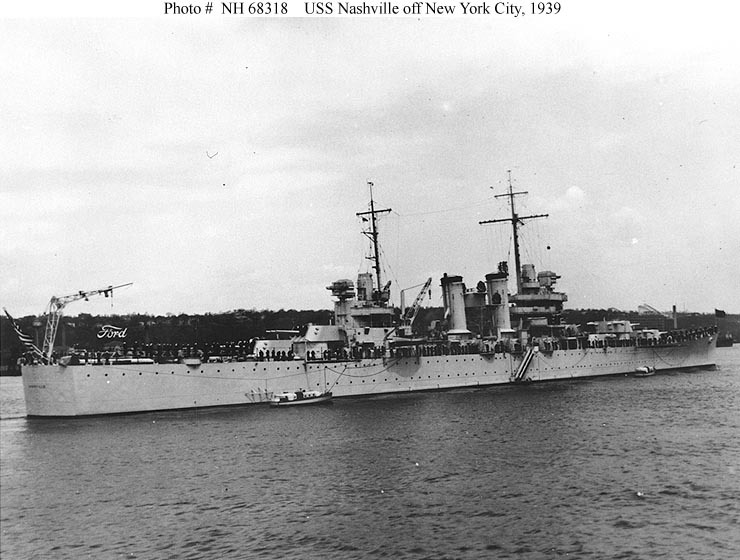 USS Nashville (CL 43) In the Hudson River, off New York City, in 1939. The Palisade Amusement Park is in the right distance. Courtesy of Donald M. McPherson, 1969. 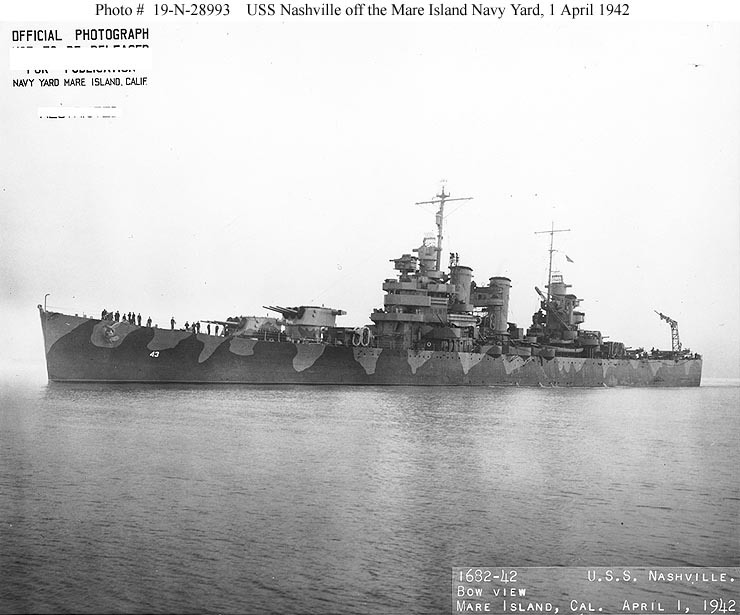 USS Nashville (CL 43) Off the Mare Island Navy Yard, California, on 1 April 1942. She is wearing Measure 12 (Modified) camouflage. 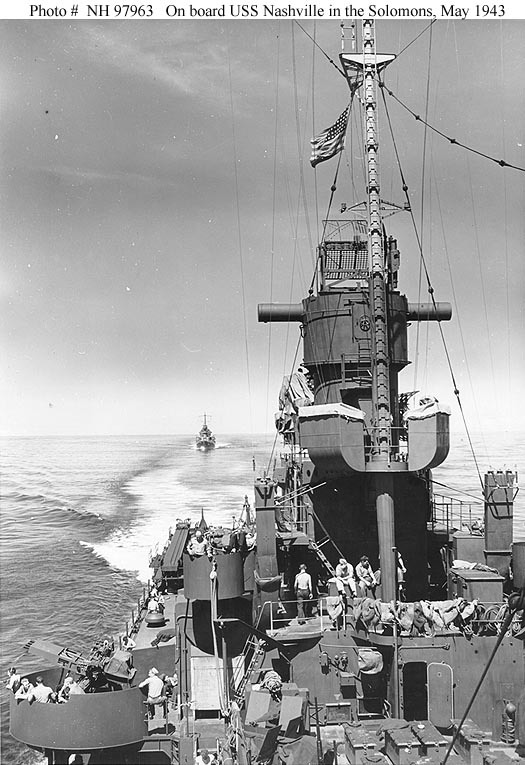 020833 62k USS Nashville (CL 43) (in the distance), as seen from the island of USS Hornet (CV 8) (looking aft) while part of the "Doolittle" battle group, 16 APR 1942. Photo taken off a 16mm film. 0404334 195k View looking aft from the island of USS Hornet (CV 8), while en route to the mission's launching point. 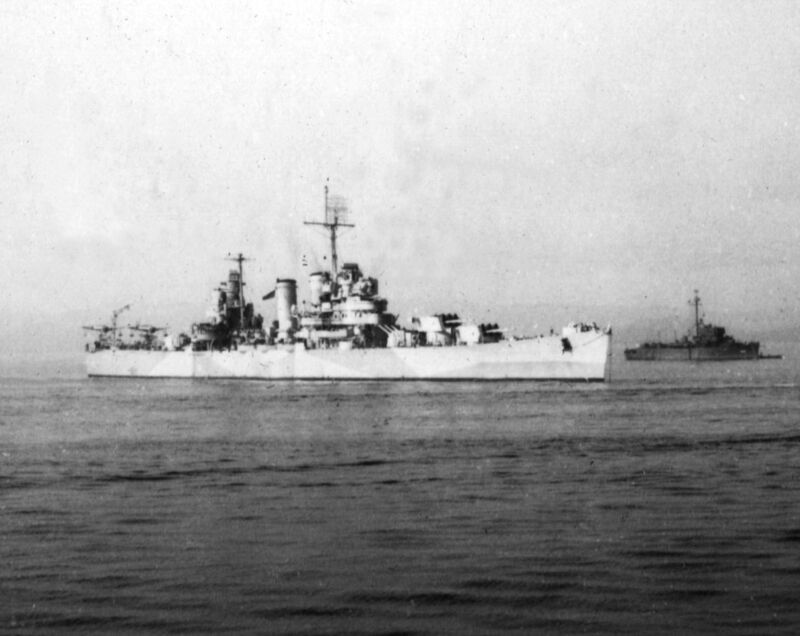 USS Gwin (DD 433) is coming alongside, as USS Nashville (CL 43) steams in the distance. 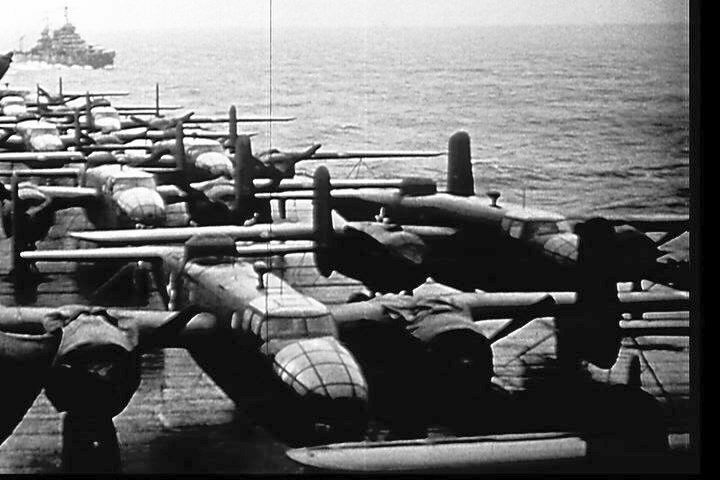 Eight of the mission's sixteen B-25B bombers are parked within view, as are two of the ship's SBD scout bombers. 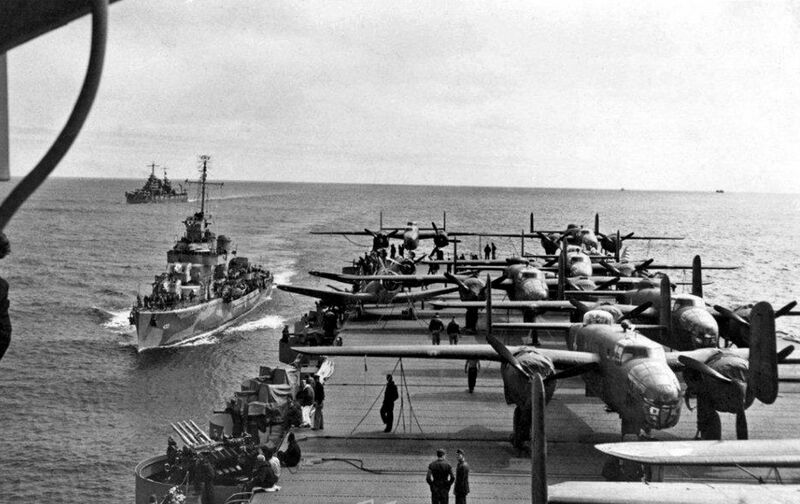 Note midships elevator, torpedo elevator, arresting gear and flight deck barriers in the lower portion of the photo, and 1.1" quad anti-aircraft machine gun mount at left. 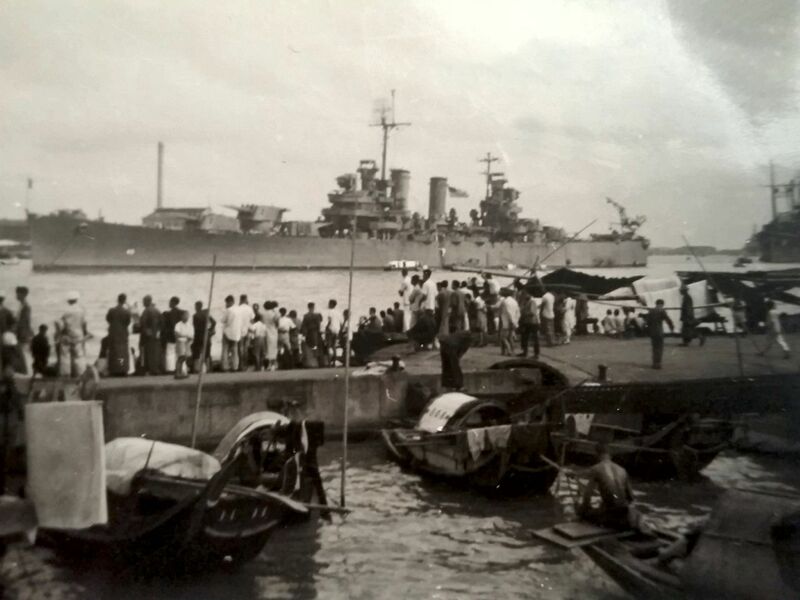 Naval History & Heritage Command photo (# NH 53289). 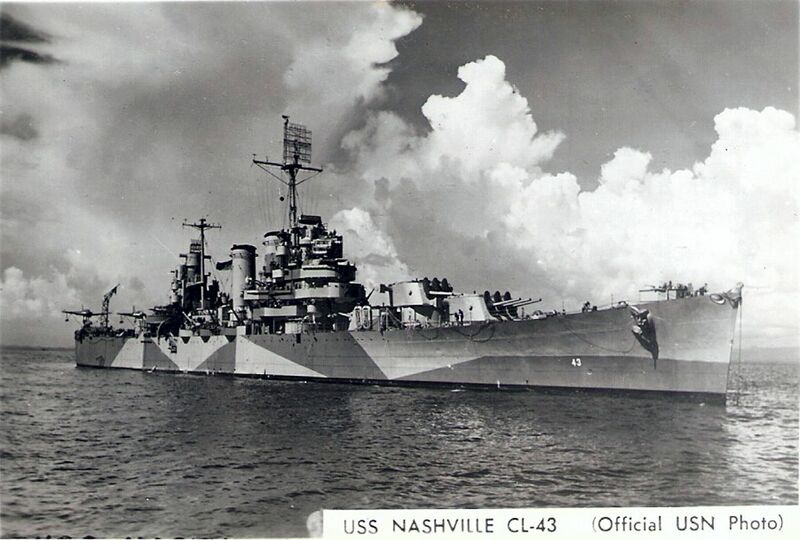 USS Nashville (CL 43) - View on board the ship, looking aft from amidships on the starboard side. Taken on 11-13 May 1943, before or just after Task Force 18's 13 May bombardment of Japanese positions on Kolombangara and New Georgia islands. 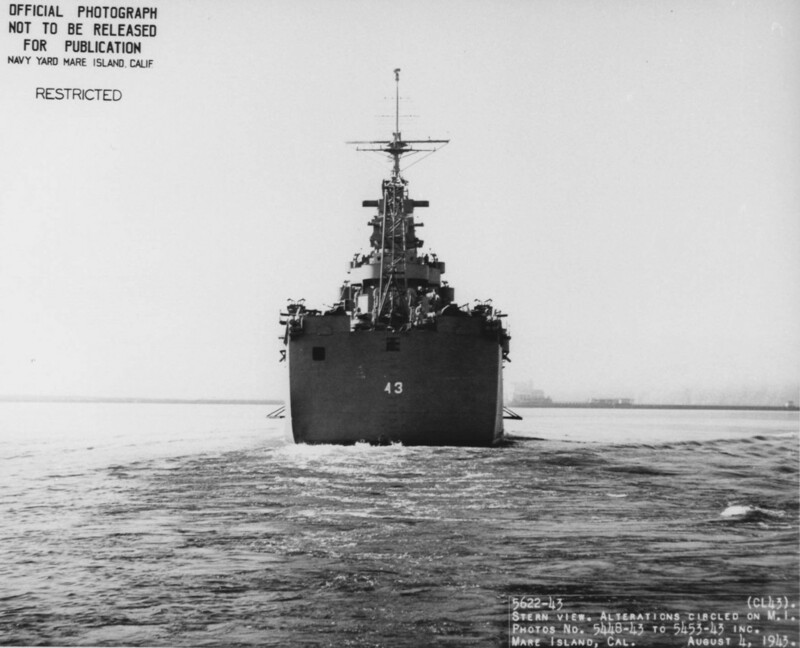 The ship immediately astern is USS St. Louis (CL 49). 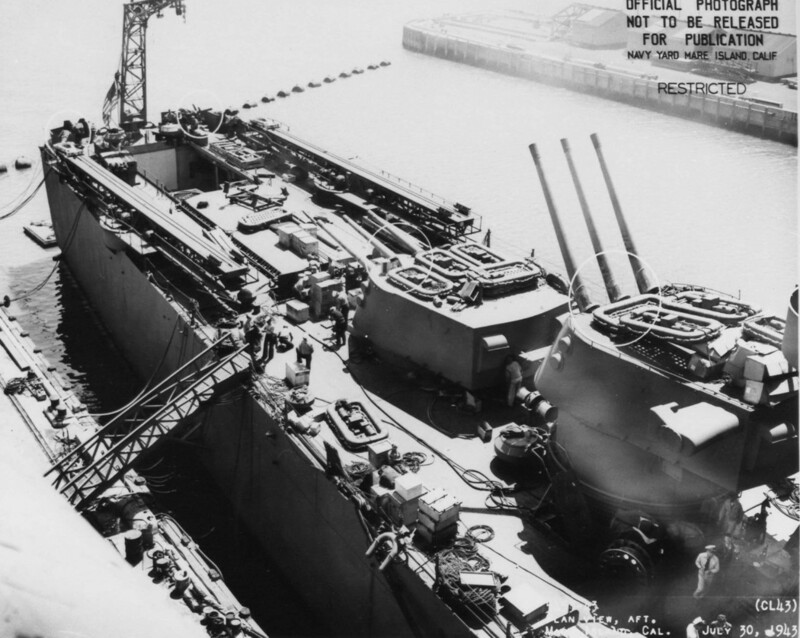 Note details of Nashville's after superstructure, main battery gun director, and the 1.1-inch quad anti-aircraft machine gun mount at left. 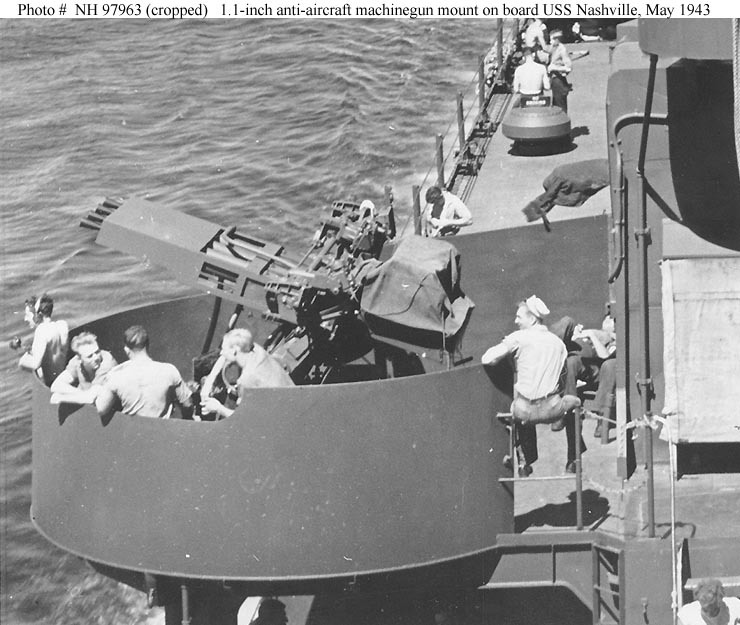 1.1-inch quad anti-aircraft machinegun mounting Located on the starboard side amidships of USS Nashville (CL 43). 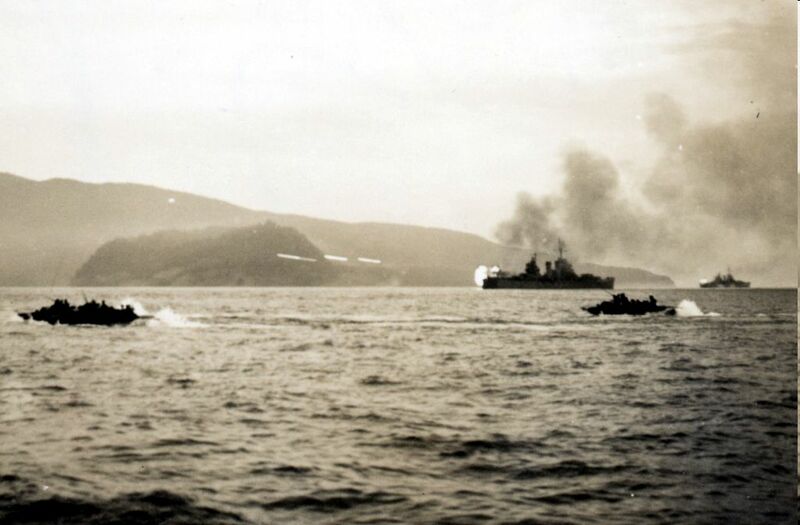 Photographed 11-13 May 1943, before or just after the 13 May bombardment of Japanese positions on Kolombangara and New Georgia islands. Note the metal shroud installed around the barrels of this gun mount. 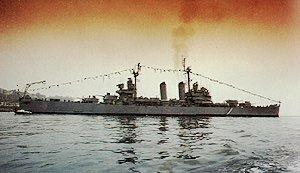 Official U.S. Navy Photograph, from the collections of the Naval Historical Center - NH 97963 (cropped). USS Nashville (CL 43) - Plan view amidships, looking aft along the starboard side, with the ship's forward superstructure emphasized. Taken at the Mare Island Navy Yard, California, on 30 July 1943. Note the Mark 33 (lower, with rear toward the camera) and Mark 34 gun directors, with the antenna of a Mark 8 fire control radar atop the Mk. 34; antenna for a SK-1 search radar atop the foremast; lightly armored conning tower at the front of the bridge; floater nets atop the number three 6"/47 triple gun turret; and shipyard railway crane on the pier. Circled areas have recently received modifications. 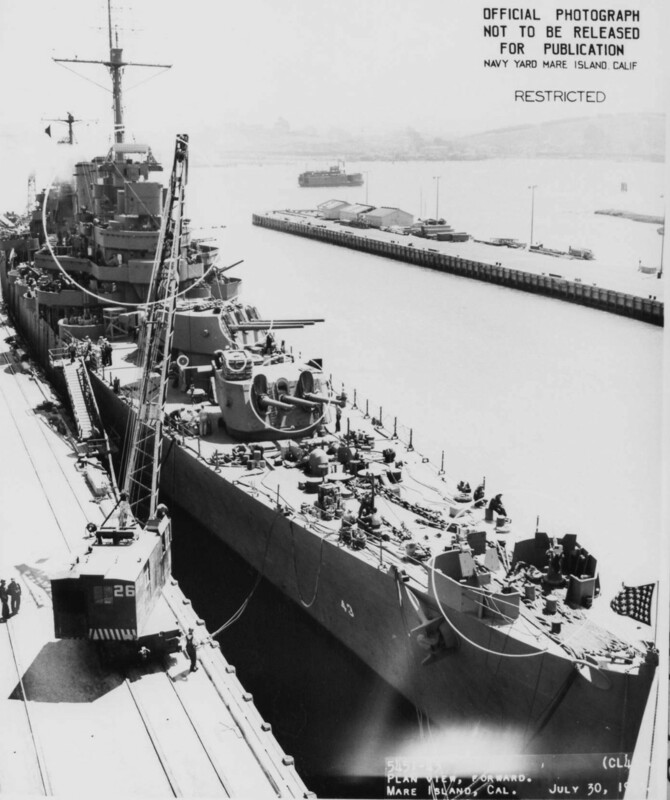 Plan view amidships looking aft of the USS Nashville (CL 43) at Mare Island on 30 July 1943. 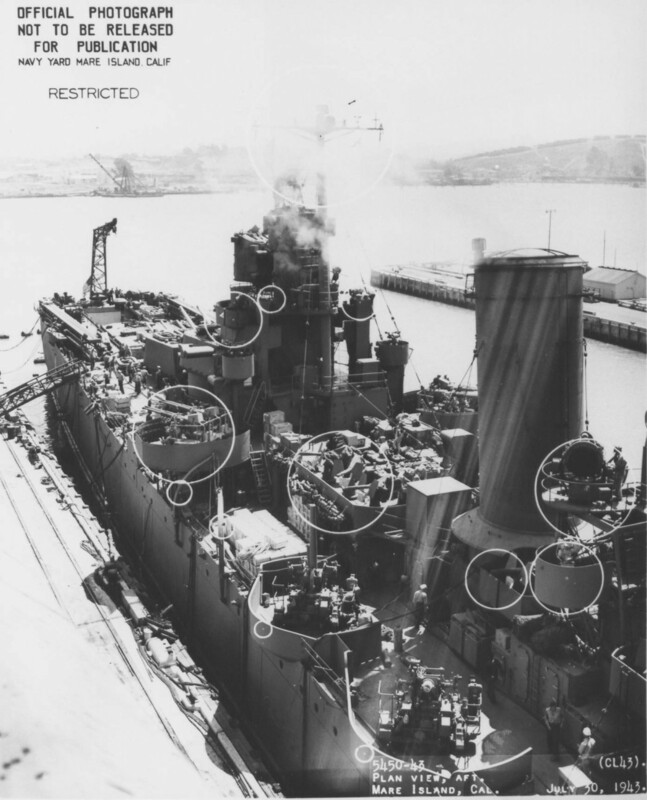 After plan view of the USS Nashville (CL 43) at Mare Island on 30 July 1943. Note that hanger for scout plane is open. Stern view of the USS Nashville (CL 43) departing Mare Island on 4 August 1943. 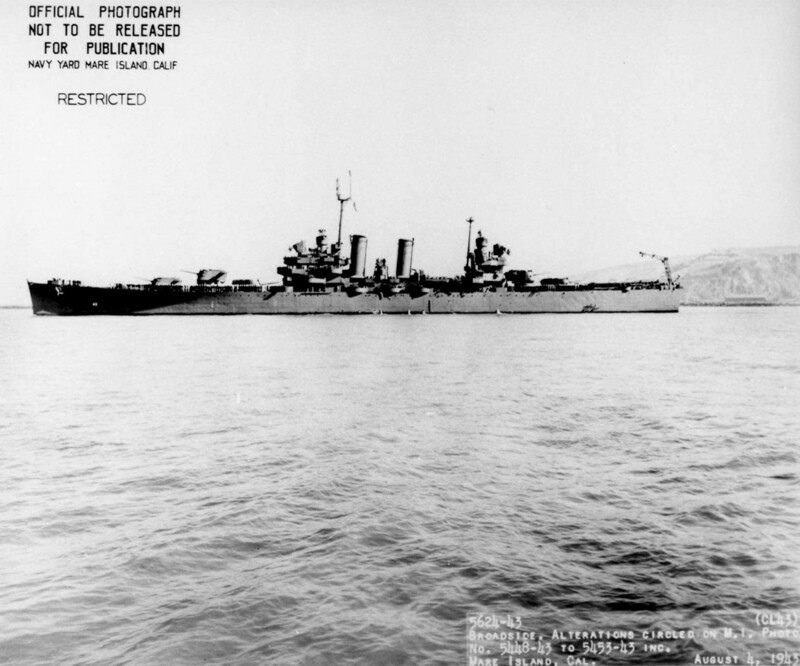 Broadside view of the USS Nashville (CL 43) off Mare Island on 4 August 1943. 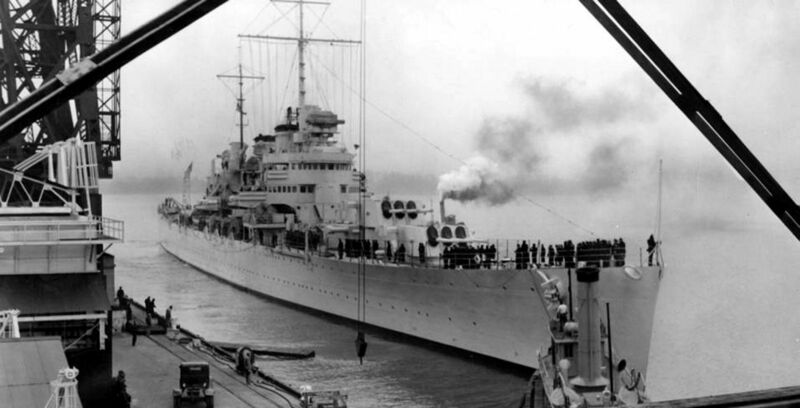 She was in overhaul at the shipyard from 4 June until 7 August 1943. Port bow view of the USS Nashville (CL 43) off Sydney, NSW, Australia. 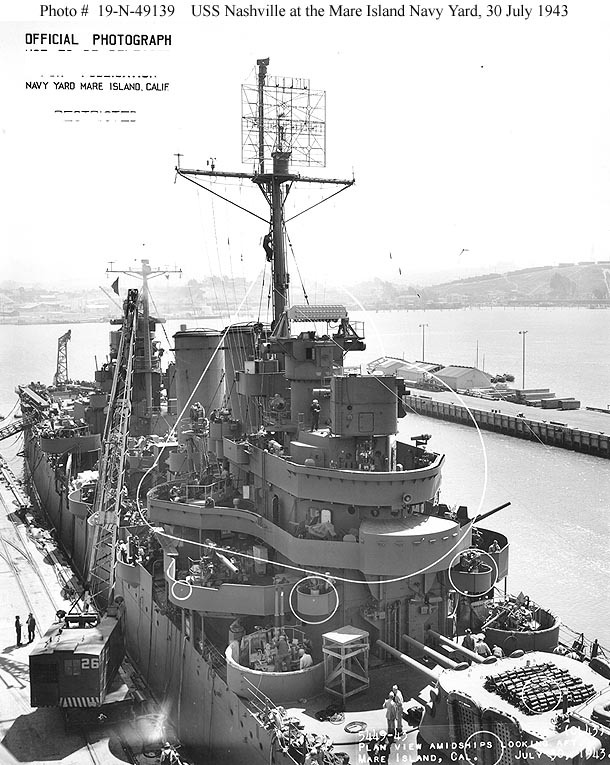 The rebuilt bridge structure dates the photo as after her May-July 1943 Mare Island rebuild. The ship still retains her 5”/25 secondary guns in main deck tubs and quadruple 40mm Bofors are mounted on at both the forward and aft superstructures. Here she is shown in measure 32/21D, a camouflage pattern that she only carried from sometime in the spring of 1944. Caption corrected by Aryeh Wetherhorn. General Douglas MacArthur walks to the bridge on one of the cruisers of the invasion fleet. Southwest Pacific Area. 22 April 1944. 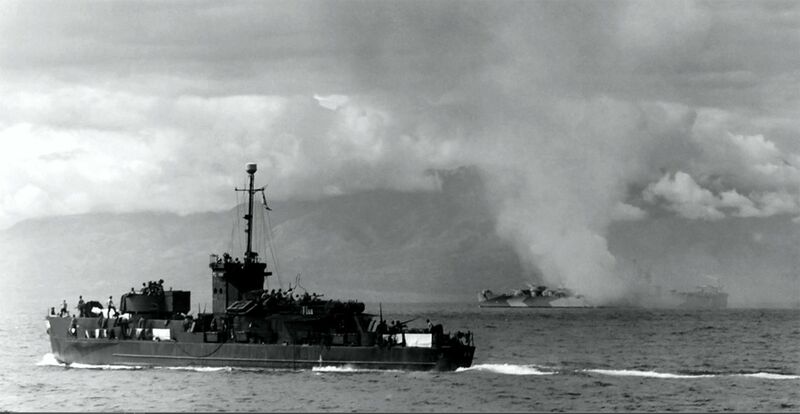 USS Nashville"
In the distance is USS Nashville firing at targets during the Hollandia assault during the week of 22 April 1944. Notice that the open camera shutter has caught three hot shells in motion just to the left of the ship. NA USA Signal Corps 264436. 0404328 103k General MacArthur has a lighter moment with commanding officer Captain Spanagel aboard the USS Nashville, 8 September 1944, en route to the Morotai invasion. 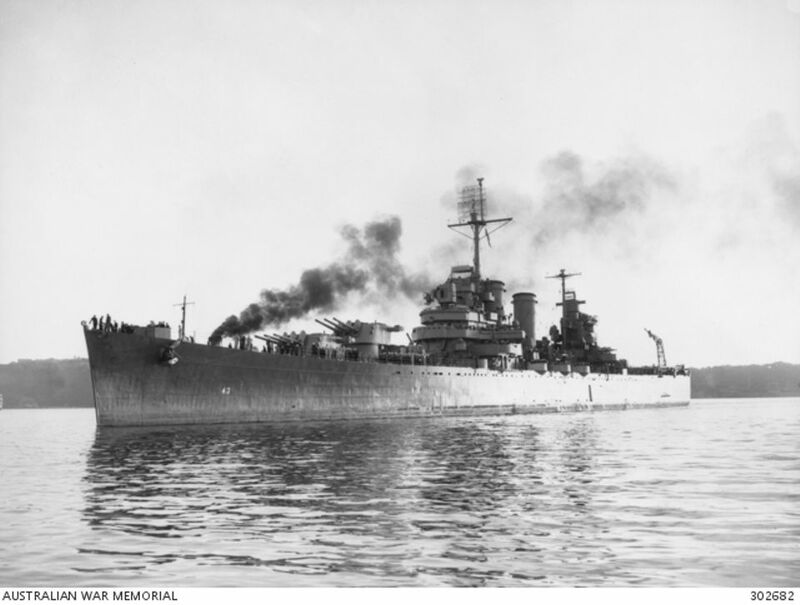 The island of Morotai was needed as a base of operation to support the liberation of the Philippines. 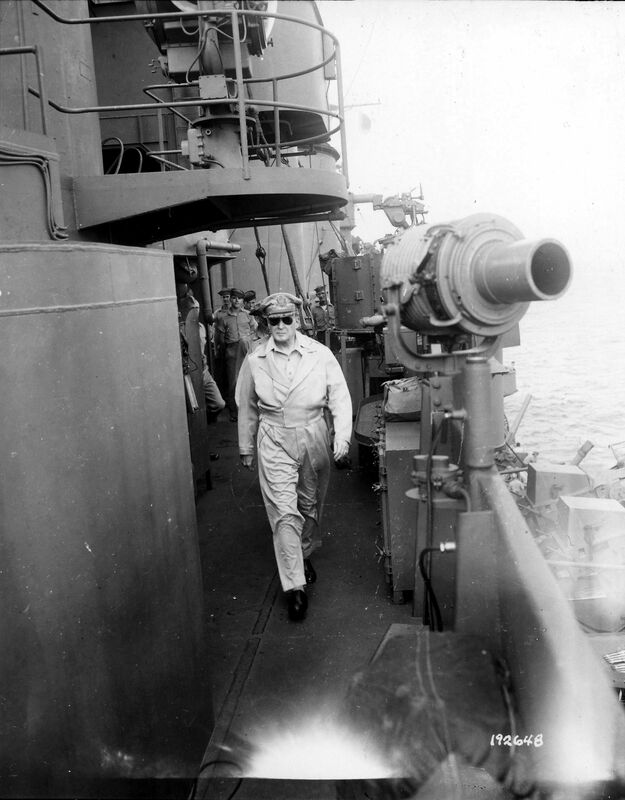 General MacArthur would return to the Philippines aboard the USS Nashville on October 20, 1944. Photo from the MacArthur Library and Museum thanks to Mr. James Nobel. 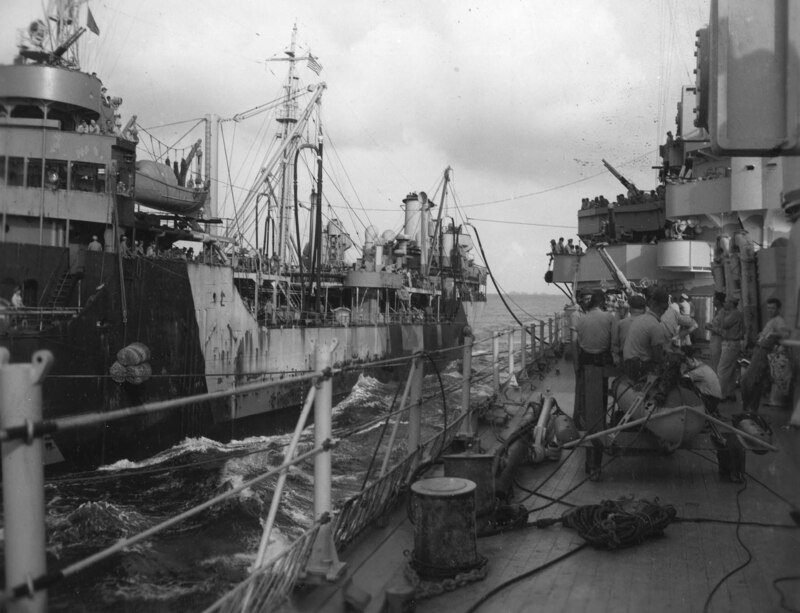 USS Nashville (CL 43) receiving fuel from USS Saranac (AO 74) on the afternoon of 15 October 1944 as she steamed for Leyte Gulf in the Philippines with General Douglas MacArthur and his staff aboard. This underway replenishment saw the transfer of 81,727 gallons of fuel oil in just under 50 minutes, which Nashville burned through in about three and a half days. Sailors in the foreground of Nashville's deck are clustered around one of her paravanes, used to pull mine sweeping chains out from the ship's bow. 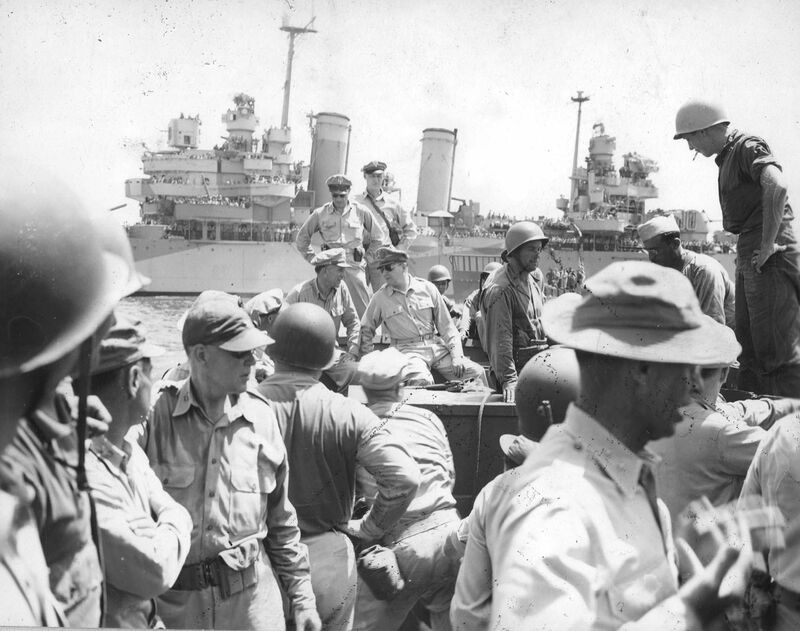 0404329 128k Captain Charles Edward Coney (far left), Commanding Officer, and his staff greet General Douglas MacArthur as he boards the cruiser USS Nashville (CL 43) for the Leyte invasion to liberate the Philippine Islands in October 1944. 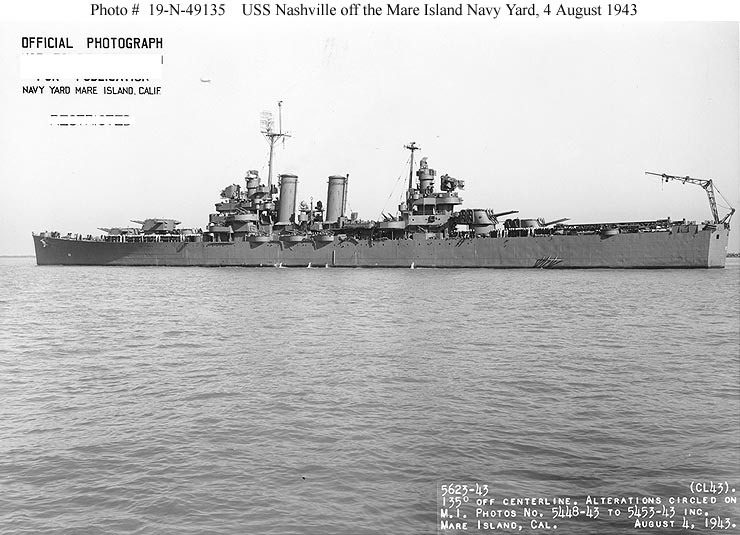 To the right of MacArthur is CDR Thomas Corwin, Nashville's Executive Officer. 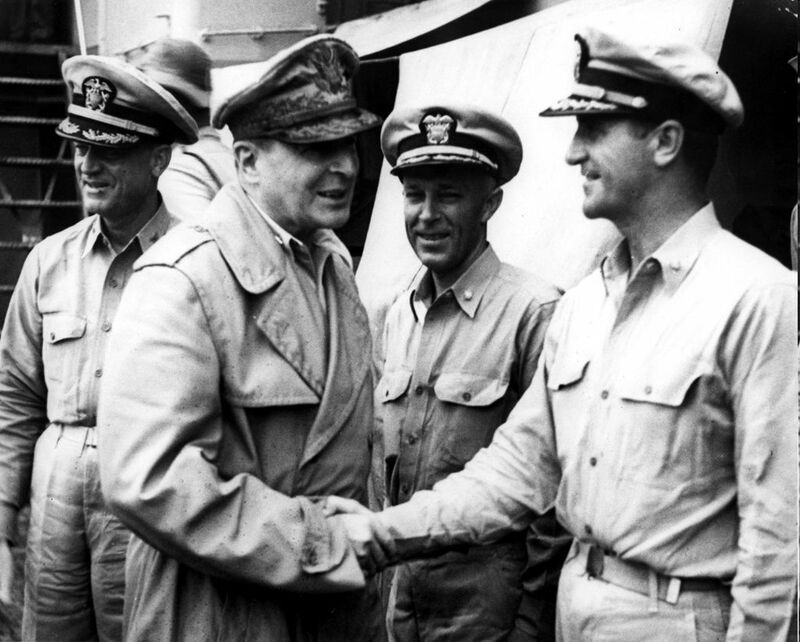 The name of the gentleman shaking MacArthur's hand is unknown. Photo was taken by Frank Prist of ACME News Service (Wide World Photos). Photo obtained from the MacArthur Library and Museum thanks to Mr. James Nobel. Leyte Invasion, October 1944 - General Douglas MacArthur (right, seen in profile) on the bridge of USS Nashville (CL 43), off Leyte during the landings there in late October 1944. 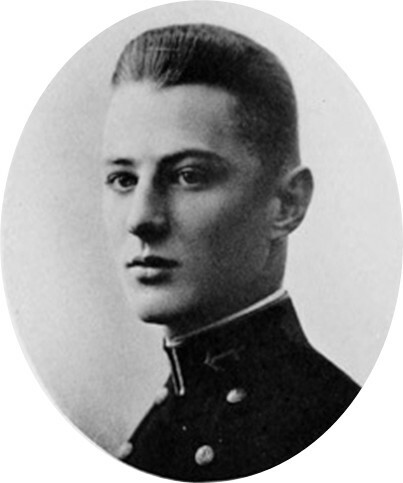 Standing in the center (also seen in profile) is Lieutenant General George C. Kenney. 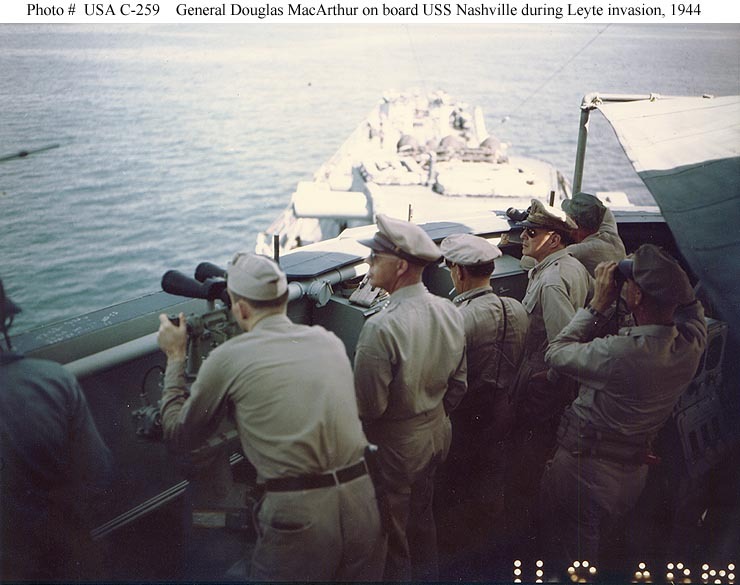 Army General Douglas MacArthur and his staff leave Nashville via LCM on 20 October 1944 for his triumphant return to the Philippine Islands roughly two and a half years after he was evacuated during the Japanese invasion. Shortly after this photo was taken MacArthur waded ashore and gave his famous "People of the Philippines: I have returned" speech via a portable radio ashore before returning to the ship. US Navy photo #80-G-289536 now in the custody of the US National Archives, College Park, Maryland. 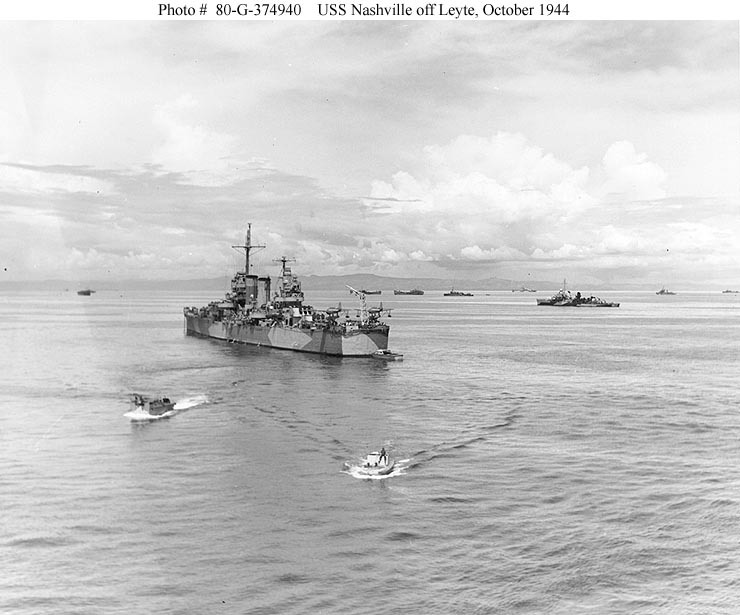 Leyte Invasion, October 1944 - General Douglas MacArthur's flagship, USS Nashville (CL 43), anchored off Leyte during the landings, circa 21 October 1944. 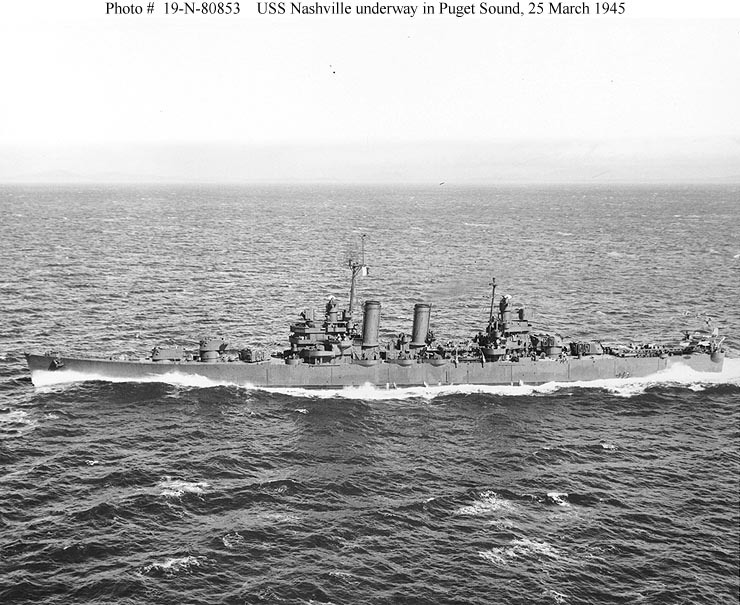 Nashville wears camouflage Measure 33, Design 21d. 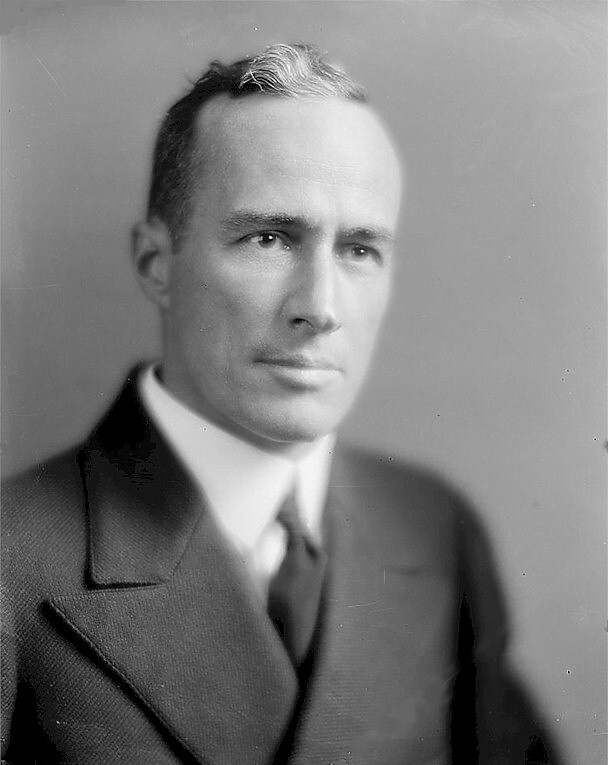 Official U.S. Navy Photograph, now in the collections of the National Archives - 80-G-374940. USS Nashville (CL 43) on 24 October 1944 anchored off Tacloban, Leyte, General Douglas MacArthur is shown boarding a PT boat from Nashville. National Archives Photo #80-G-258488, courtesy of C. Lee Johnson, usndazzle.com. 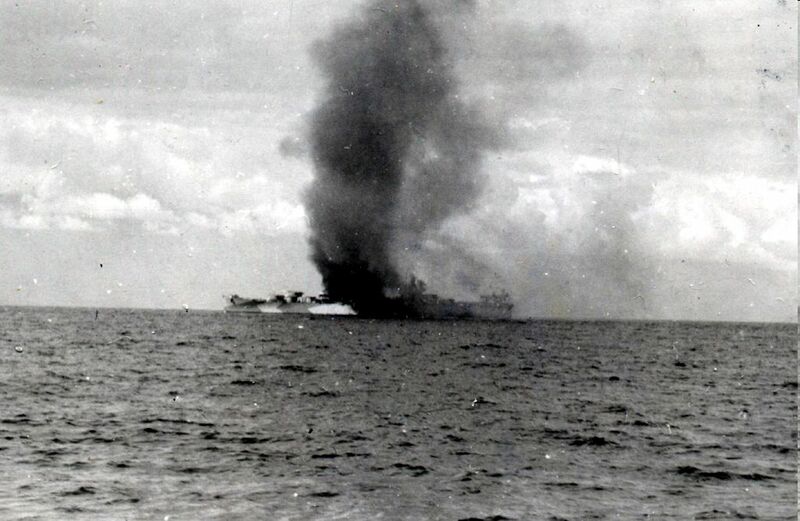 Smoke from fire aboard USS Nashville, seen in the distance shortly after being damaged in combat off Mindoro, 13 December 1944. NA USA Signal Corps 260126. 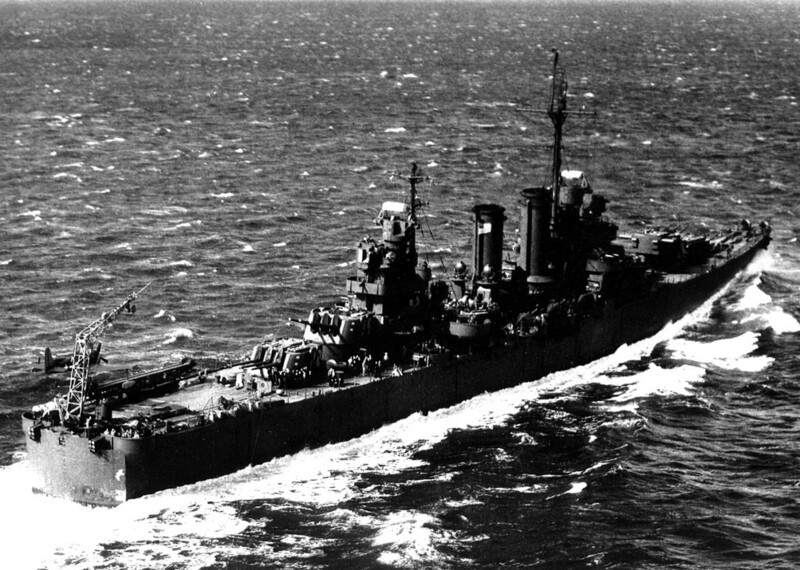 USS Nashville off Mindoro, 13 December 1944. Smoke pall from the kamikaze hit is still lingering. 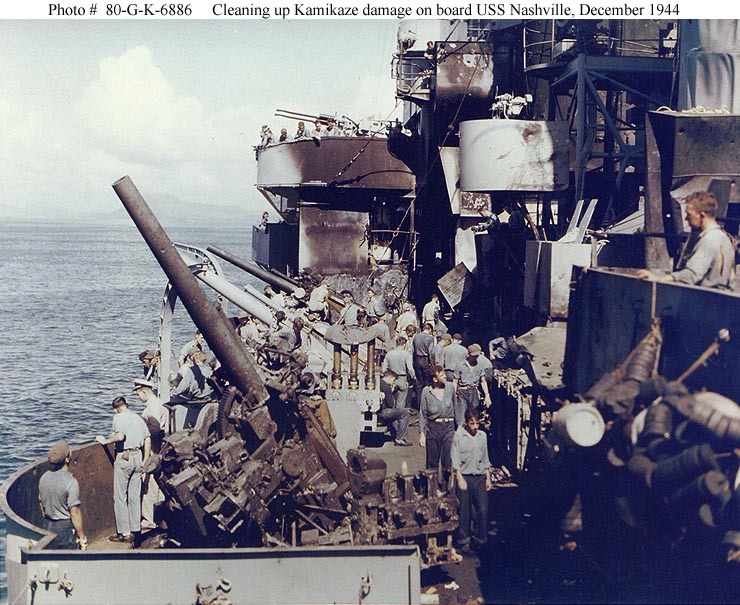 USS Nashville (CL 43) crewmen cleaning up the port side 5"/25 gun battery, after the ship was hit in that area by a Kamikaze on 13 December 1944, while en route to the Mindoro invasion. Note fire damage to the guns and nearby structure. 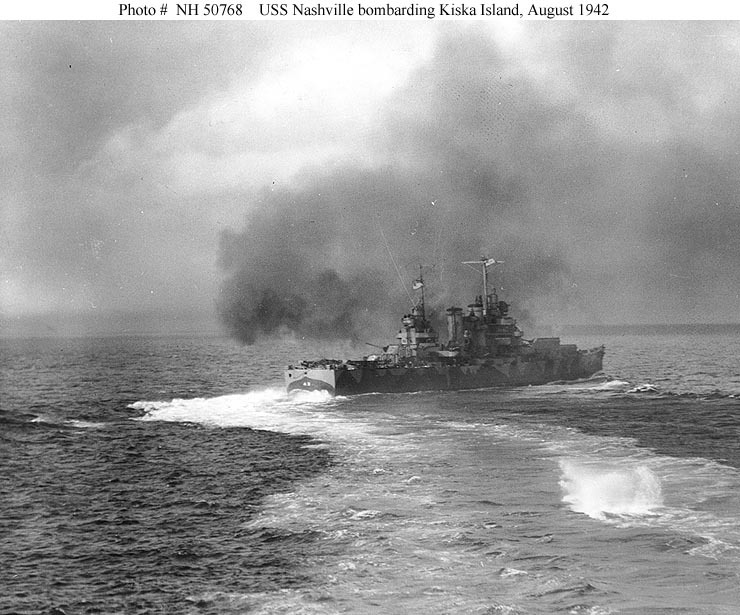 Official U.S. Navy Photograph, now in the collections of the National Archives - 80-G-K-6886. 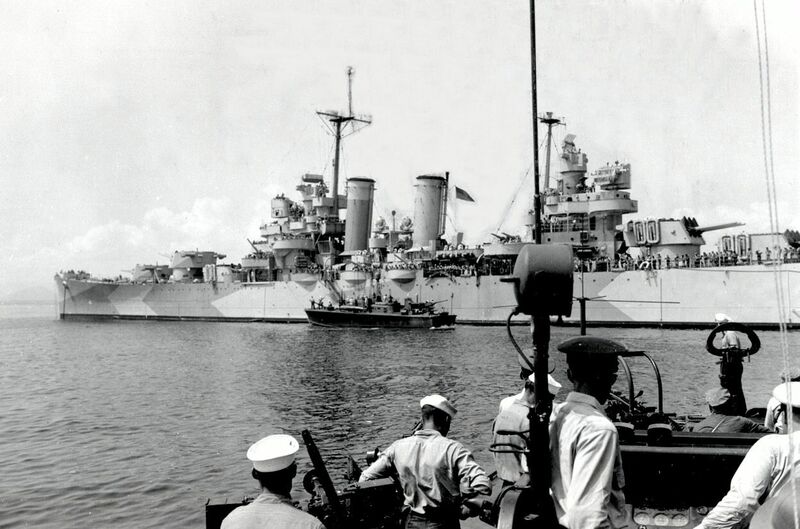 USS Nashville as seen from USS Russell at San Pedro, Leyte anchorage, 15 December 1944. Photo by Ltjg Ed Klump. 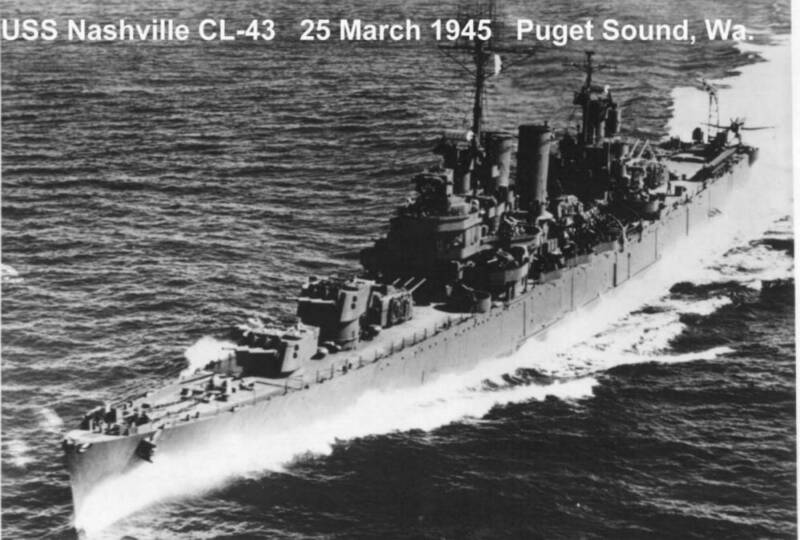 USS Nashville (CL 43) Underway in Puget Sound, Washington, on 25 March 1945. 04043prat 20k Agustín Arturo Prat Chacón (Hacienda San Agustín de Puñual, Ninhue, Chile, 3 April 1848, - Iquique, 21 May 1879) Chilean sailor, military and lawyer. He is considered Chile's top naval hero. Son of Agustín Prat del Barril and Rosario Chacón Barrios. 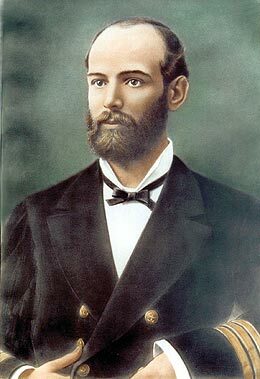 He took part in several major naval battles during the War against Spain (1865-1871), including the naval Battle of Papudo in 1865, where the schooner Covadonga was captured. 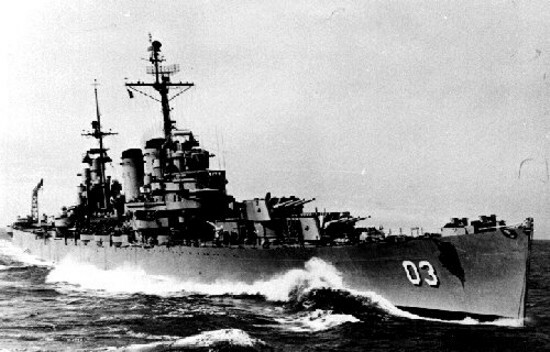 During the Pacific War he commanded the corvette Esmeralda in the naval Battle of Iquique, in which he was killed.